In countries like India and Sri Lanka, cricket is more than just a game. It is a craze, a passion and an obsession which had taken over daily life. In this light of interest it is no surprise that director Ajit Pal had based his directorial feature debut on the game of the era in his home country. More interestingly, the movie which is said to be the first film made entirely on a cricket story will feature many stalwarts in the field. Sanath Jayasuriya, Muttiah Muralitharan, Kumar Sangakkara, Chaminda Vaas, Dilhara Fernando, Fareez Maharoof and Ajantha Mendis make up the cricketers starring from the Sri Lankan squad while Brett Lee, Mike Hussey, Simon Katich, Stuart Clarke, Brad Hogg, Brad Haddin, Allan Border, Michael Slater, Dean Jones, Shoaib Mallik, Sohail Tanvir, Rao Iftekhar, Kamran Akmal, Waqar Yoonus, Graeme Smith, Andre Nel, A. Morkel, Pat Symcox, Harbhajan Singh, Dinesh Karthik, P.R. Singh, Praveen Kumar, Yusuf Pathan, Ashish Nehra, Ramesh Powar, Novjot Singh Siddhu, Maninder Singh, Atul Wassan, Martin Crowe and others make their appearance on the internationally famous cricketers list. Among them Australian cricketer Brett Lee plays a more prominent role while a playback song sung by Lee adds more colour and depth to the creation. Upcoming actor from the Bollywood scene, Harman Baweja, with his athletic physique and sportsman charisma, had landed the lead role of Vijay Shekhawat while the petite Amrita Rao will dazzle the screen as Nandini. Anupam Kher and Gulshan Grover make up the other key players in ‘Victory’ while Baweja’s ex-girlfriend, Priyanka Chopra, makes a special appearance. “I have a lot of hopes pinned on ‘Victory’. It’s been a tough film to shoot. A lot of cricket training, lots of gruelling outdoor went into it. It was very detailed training and demanded about four hours of training every day. It’s taken its toll on my health,” Baweja expressed on his second movie following his debut ‘Love Story 2050’. “I hope I get my due. My cricket coach Pravin Amre says if I had come to him some years earlier I could’ve played for the Ranji trophy. I want to pursue cricket beyond ‘Victory’,” he added. The movie was shot across eight cricketing nations round the globe including India, Australia, Sri Lanka and South Africa and at 18 major stadiums. It was shot at the Tamil Union Ground a.k.a. The Oval, Borella, Indoor Nets, Battaramulla, Trans Asia Hotel, Cinnamon Grand Hotel and a few other locations in the city. Leading international film production company Film Location Services led by filmmaker and producer Chandran Rutnam handled the production and coordination in Sri Lanka. ‘Victory’ relates the story of a struggling cricketer who beats all odds to make an impossible dream a reality. It centres on a father whose dream is to see his son rising from the rustic background of Rajasthan and venturing on to become a world famous cricketer. “It’s a film on the life of any modern day cricketer who plays for the national side. It’s a story of a small town boy from Jaisalmer who has nurtured the dream of playing for India and how he finally succeeds in making it to the Indian team,” the director commented on his theme for his debut movie. ‘Victory’ made its premier around the globe and Sri Lanka on January 30. The much anticipated movie is screening at Majestic cinema and Regal, Colombo. Popular actor Ranjan Ramanayake who made hit movies like ‘Parliament Jokes’ and ‘One Shot One’ has released his latest creation ‘Leader’. The controversial movie which embodies the theme of a struggle against social conquers stars Indian actress Adeen Khan as the female lead. Robin Fernando, Anusha Damayanthi, Lala Kumara, Ronnie Leitch, Ariyasena Gamage, Chandrasiri Kodituwakku, Janesh Silva, Chathura Perera, Saman Almeida, Kingsley Loose, Anton Jude, D.B, Gangodathanna, Dasun Madusanka and others feature in the movie produced by Beven Perera and P. Aruran. The cameramen are K.D. Dayananda and Santhosh from India. Ajith Ramanayake and Ayesha were the editors while Teddy Widyalankara and Super Subramaniam from India were the fight directors. The art directors are Lal Gurubavila and Lionel Watthalage. Aruna Priyashantha Kaluwarachchi and M. Gandhi handled the sound effects, the music is by Suneth Kalum and Sunil Perera, Ranjan Ramanayake, Havi Susan, K. Sujeewa and Gamunu Wijesuriya provided background vocals. Around 40 copies of the film are shown at theatres island wide making ‘Leader’ the film that had been screened with the most number of copies in Sinhala cinema history. Dharmananda Wijesinghe who had gained recognition for his skills for organising events and is well versed in the field of administration is elected as General Manager for the National Film Corporation. Though he is occupied as an engineer he had studied a variety of subjects including cinema and journalism. He is a postgraduate diploma holder and a graduate of the University of Sri Jayawardanapura. His career as a visiting lecturer in journalism and new technological methods spans more than a decade and he had conducted lectures for the army on media coordination under the Media Centre for National Security. He is also one of the pioneering web designers in the country. For all those who have been waiting for this one, Eros International announces the worldwide release of Billu Barber on February 13. 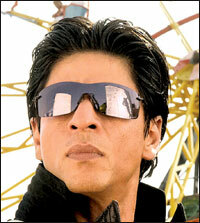 Shahrukh Khan’s Billu Barber is a slice of life, a feel-good musical with elements of romance, comedy and drama. Starring Irrfan Khan, Lara Dutta and Shah Rukh Khan, this is the first time that SRK and renowned director Priyadarshan come together. Billu Barber is a story of a simple ordinary man who led an extraordinary life. Bilas Rao Pardesi was living in his village with his wife Bindiya and two great kids. Life was bitter-sweet...we can say more sweet than bitter. One day a superstar came into their lives and everything changed. Life changed, people changed, friends changed, the village changed but one man did not...Billu Barber. Don’t be surprised! Kodambakkam (in Chennai) Thamil films too can knock at the doors of the International Film Festivals too! Yes, I saw a few films that entered the two International Film Festivals held at the tail end of last year in India. Some of them are yet to be shown in Lanka. If you are interested here is a critical briefing on one of them. Let’s take a film titled Mudhal Mudhal Mudhal Varai. What it literarily means is “from the beginning to beginning to beginning” It’s funny, isn’t it? What the director (Krishnan Seshadri Gomatam) wanted to make us understand is that there were several turning points for the first time in the development of Thamil Cinema. In other words the film tries to be spoofy in characterizing the several ways a film is made in Thamilnadu. The direction is in some respects innovative, the editing (B.Lenin, an excellent editor who is one of sons of a famous Thamil film director of yesteryears - Beem Singh) creative and camera (Fowzia Fathima) is near ultra-modern technical virtuosity. The kind of music (Aslam Mustafa) fusion electronically recreated. So, I like it. The players all new to me: C P Satyajit, Anuja Iyer, Charan and Keevna. They may be from the Film schools somewhere. Realistic, casual and funny - that’s my delicacy. Huggy air passionate about filmmaking. He has a sense of humour. What he does is to record people and him too in his digital camera. Collating those images surprisingly turn out to be a plausible film script. His girl friend Sindhu suffers from a terminal illness. She will marry hi only when he completes his first film. He searches desperately for a producer, while he works as an ad filmmaker. One of his team-mates suffers from Obsessive Compulsive Disorder (OCD). He plays the key role as to sacrifice his life for a suitable ending in the film. The director-Krishnan Seshadri Gomatam- had worked as an associate of Mani Ratnam (off beat Thamil and Hindi filmmaker) and P C Sreeram (ace cinematographer) and Santosh Sivan (another avant-garde filmmaker in Thamil and Malayalam). For me to understand the film better (I am also interested in Hindu Philosophy) I listened to Gomatam’s reading of the film. “Like a bright collage, the film puts together a series of sensuous moments through Huggy’s eyes. We discover a variety of experiences- his, his girl friend’s, others. The film captures an India that simultaneously lives in different time zones cultures, age groups, values, attitudes. At another level it explores Life from Birth to Death. The film and the filmmaker mirror each other, making the narration self-reflective. It is essentially a spiritual inquiry into the raison d’etre of life and death. Does one have to die in order to prove that he actually lives, or does one live in order to die? Queries that are art of eternal quest are integral to First Time”. It is unlikely that this film will be shown here as it may not run in the commercial circuits. But it is an interesting film for the cineastes.